To walk the whole ridge in one attempt presents major logistical problems; the six summits are laid out in a line, meaning there is no easy way to reach all the peaks without a long track back along one of the adjacent valleys. But a day traversing the four northernmost peaks combines the best these hills have to offer; enjoyable scrambling, the finest ridge walk this side of Crib Goch and the best views of Snowdon you can find. This circular walk takes you over the peaks of Y Garn (633m), Mynydd Drws-y-coed (695m), Trum y Ddysgl (709m) and Mynydd Tal-y-mignedd (653m), finishing with a descent through the dense conifers of the Beddgelert Forest. The route starts and finishes at the bus stop in Rhyd-Ddu, which means you to travel using the Snowdon Sherpa, the walker-friendly bus network that serves the Snowdon region so well. Leaving the car behind allows you concentrate on the stunning scenery in this part of the world, rather than the busy winding roads. The summit of Y Garn offers the first great views of the day; to the north is the dramatic face of Craig y Bera on Mynydd Mawr, rising up above the Nantlle valley; looking east is Yr Aran, one of Snowdon’s most photogenic outposts. The summit of Y Garn also poses one of those enduring mysteries of the countryside – why did someone need to build a dry stone wall up here, and how long must it have taken, bearing in mind the journey to work each day? The wall that takes a near-perfect line down the rocky north-western shoulder is even more remarkable; anyone who has spent time attempting the arduous task of drystone walling will be impressed. From the comfort of Y Garn, the scramble up to Mynydd Drws-y-coed can look a little intimidating; the drop down the right-hand side over Clogwyn Marchnad commands a healthy respect. But once you are in among the rocks, the holds are large and plentiful and the path follows an easy line. Those who prefer an edge to their scrambling can stick to the crest; for others, there are plenty of routes to the left of the cliff, a safe distance from the foreboding face yet with plenty of enjoyable routes. Along the ridge to Trum y Ddysgl, the walk switches from a rocky scramble to a simple romp over smooth, grass-covered slopes. Before getting into your stride, look back towards the dark, mossy crags of Clogwyn Marchnad, the western face of Mynydd Drws-y-coed. You will no doubt see a few brave sheep risking life and limb to graze on seemingly unreachable outcrops – is the dining there so much better than the gentle slopes around? Maybe some sheep are just born with an adventurous spirit and enjoy a meal with a view. Mynydd Tal-y-mignedd lies across another section of exposed ridge – the wind can take your breath away along here, as well as any stray rucksack covers and maps cases. The summit is marked by a five-foot high obelisk built to celebrate Queen Victoria’s jubilee. From here, follow the wall that runs along the southern shoulder before veering left past the rocky outcrops into Cwm Dwyfor. No clear path here, so just pick a line across open access land and head into Cwm Pennant. The route joins a bridleway through the Beddgelert Forest, a sprawling coniferous plantation that stretches right across to the village that bears its name. The path skirts along the edge of the forest, soon passing an old disused mine shaft, now fenced off to prevent unwary hikers from missing the shaft, hidden amongst a sea of ferns and mosses. There are reminders of Snowdonia’s industrial past all along this route, relics from a different age before the tourists started arriving in numbers. 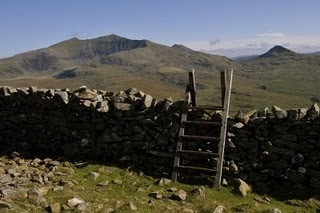 From the ridge, disused slate mines and quarries are clearly visible on many of the surrounding hillsides; at the foot of Elider Fawr, on the western flanks of Snowdon, by Llyn-y-Gader and dotted along Cwm Pennant. Are these an ugly scar on a beautiful landscape, or an important relic from past times in these valleys? 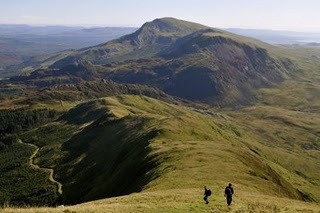 Perspectives may differ, but they are an unavoidable feature of most walks in Snowdonia. After leaving the forest, the bridleway skirts the bottoms of the hills you have just enjoyed, before dropping back into Rhyd-Ddu the way you came in. Time for a final gaze upon the distinctive skyline of these rewarding hills. Rhyd Ddu is located on route S4 on the Snowdon Sherpa bus network, which runs between Caernarfon and Porthmadog. A day ticket costs ( for children) and allows you to hop on and off the network as many times as you like. For up-to-date timetable information, visit www.gwynedd.gov.uk/bwsgwynedd or ring traveline on 0870 608 2608. 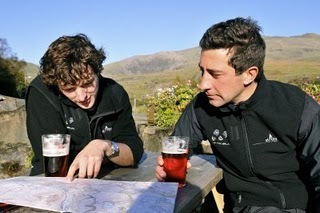 The Cwellyn Arms in Rhyd-Ddu has catered for walkers descending Snowdon by the Rhyd Ddu path or the Snowdon Ranger path for years, with a good selection of hot meals and pre-walk snacks available. Leaving the car at home also means you can enjoy one of the pub’s nine real ales. Near to the pub, the newly opened Snowdon Inn (01766 890321) offers affordable yet comfortable accommodation of all kinds, including Bed and Breakfast, a bunk house and a campsite. Words by Tim. Thanks to Laura Crow for the photos.